This photo, taken from our window at dusk, shows the NYC skyline from 50th Street to the Bronx. Those two buildings that look like a smaller version of the World Trade Center are the Time-Warner Center. Blah blah blah art … blah blahdy blah dusk. Oh sorry, TW. Were you talking to me? 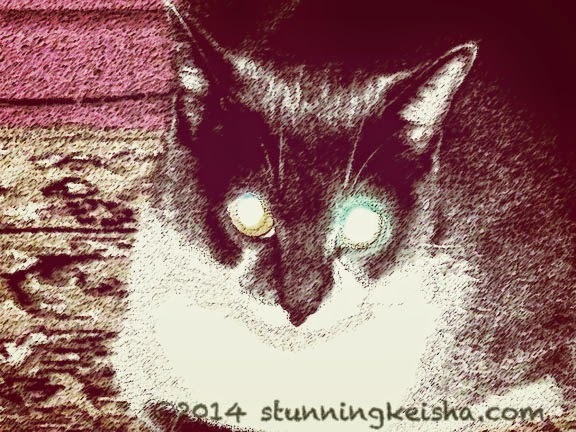 Is this about the Saturday PhotoHunt and Caturday Art Blog Hop? You better have some good ideas or I’m gonna give you some. Yo! Furrends! Have we got a blog for you today. Not only are we sharing a photo without The Cat that The Cat had to Photoshop herself into but the laser eyes have it in my art submission. My teeth and claws are sharp and I beat out the piece of %%@&#& that TW wanted to feature. The theme is dusk so The Cat has her lasers set on high. I wouldn’t want someone to ram me head-on. This pic was unusable until we made an art project out of it. 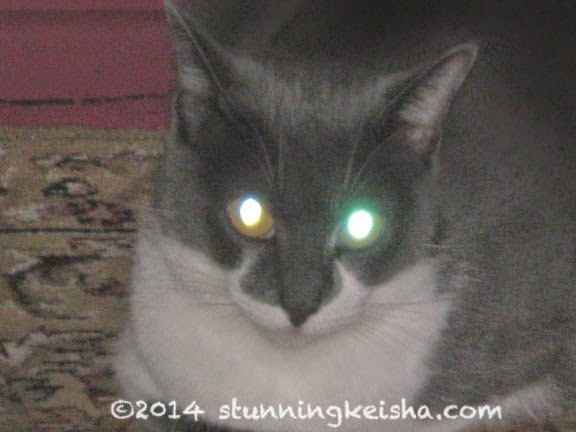 I don’t permit TW to publish laser-eye pics. My eyes are my best feature so she better get ‘em right. We did a sepia version so we could also participate in Sepia Saturday blog hop over at Ruckus the Eskie’s place. Click on the links and check out all the submissions in each blog hop. For those innerested, here is the original photo. It’s untouched except for the watermark. Pretty brutal, isn’t it? I’d like to hear TW’s excuse for this one. Hope you’re having a great weekend. My human saw that photo of New York and it made her homesick (even though she is really from L.A., she always feels so much more at home in NY). That's why she wants to move into your building! Lasers? Those are more like high beams! We hope those lasers are just set to stun, CK! Nice one CK. Lasers set to stun with your magnificence. Have a super Saturday. I love the view from your window! I could live with that. Mom is useless with things like this. I'd bite her if it would do any good . The view from your window is beautiful! Love the photo arts made from the laser-eye shot. High beams and sunset beams are looking good CK! Wow!!!! That's the view from your window??? Beautiful!!! You have such a pawsome view from your window! Do you look out of it often? Your Blog is so visually stunning today! FIRST is the great shots of yous and your laser eyes! Then yous and New York! And YOUR HEADER is Glorious!!!! Wow! You can do a different colour laser with each eye! You have a lovely view from your window. OMC Those be sum lasews alwight. We think what TW did with that laser eyed photo is great, CK. And your view...wow! Did the laser take out the building. We like the sepia one...and now Mommy has...um..."ideas". Well, the original is a little bit "Yellow light/Green light"--if you had a Niptini or six, maybe your nosicle would turn red and you could be a traffic light for Art Day? Ha ha meow. I'm just bitter because my Human never helps me do ANY of this stuff. Phfft. Beautiful skyline pic! And awesome lasers, CK! Hope you have some good cuddles with your Pop for Father's Day! Nice view and we love the eyes! WOW CK....that's quite a view and we love that bright light as the sun sets on the BIG city. As for those laser eyes - VERY impressive! In case of a power failure those eyes will light up the entire condo complex! WOW the lasers of yours looks furry scary ! !